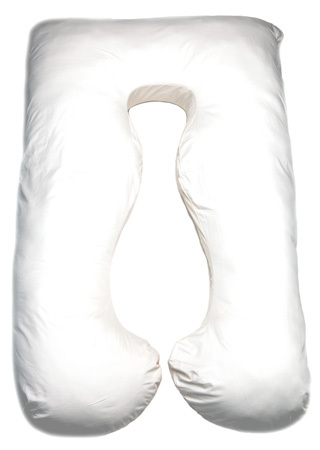 A pregnancy cushion is cushion/pillow that is designed for use by pregnant women. The general idea is that it can help pregnant women to feel more comfortable in bed, thus enabling them to get more sleep. And rest assured, you’re going to need all the sleep you can get! In fact, this is one of the most important things to consider when you’re a new parent: you will be exhausted going in to parenthood. That is to say, you start off at a deficit having lost the last 24 hours to labor and childbirth. And you better believe that sleeping isn’t about to get any easier! So you need to make the most of this opportunity to sleep as much as you can. Sleeping is hard now but this is your last chance to even attempt 8 hours for a long while. When you’re pregnant, you obviously won’t be able to lie on your stomach. Unfortunately, lying on your side is hard too as your entire stomach rolls over with you, then lies flat on the bed. You thus end up tossing and turning – which exacerbates other issues like snoring and hot flushes which will also raise their ugly heads. The idea of a pregnancy pillow then is to support you while you lie on your side. Normally these take the rough shape of a boomerang of ‘V’; with one end going under your head or arm, the other going between your legs and the middle supporting your stomach. Not only does this comfortably hold you in place and prevent you from tossing and turning (which your partner will also thank you for) but it supports your stomach and the baby inside. That’s the theory anyway but does this actually work as advertised? The answer to that depends on the size of your bump, the make of pillow you’ve opted for and the stage of your pregnancy. Looking on forums you will find that a lot of pregnant women really find the pillow to be helpful and that it helps with sleep. At the same time though, these women tend to be around 20 weeks pregnant and once they get a bit further (about 31 weeks) they often find their bump becomes too large and they start getting too hot. Mileage may vary but as you are constantly changing shape, it’s likely there will only be a window where any one product works. The other problem with pregnancy pillows is that they can be very expensive for what they are. A good tip is to avoid spending too much money on one of the brand names and to instead check the likes of Argos and eBay for simple V-shaped pillows. This way, you might even be able to buy a few in order to cater to your various different sizes throughout your pregnancy. If you want to avoid spending any money at all, you can go one step further and create your own solution. An extra pillow can be used to support your bump for example, as can a small amount of blanket (which can also be wrapped around you). If you have cushions in the living room, try using those! That said, pregnancy pillows do often have use beyond the pregnancy itself. Specifically, they can be useful for breastfeeding where they can be used to support your baby while you cradle them on the ground. The usefulness of a pregnancy pillow will vary from person to person and will depend on your size as well as how you like to sleep. For some people this can be a life-saving purchase though, so it’s worth researching. Just don’t spend too much money when there are far cheaper solutions available! Is There Such Thing as Detoxing?